Home Cricket cricketers Ms Dhoni Did MS Dhoni Abuse Manish Pandey & Said Bsdk Idhar Dekh Le, Udhar Kya Dekh Raha Hai? 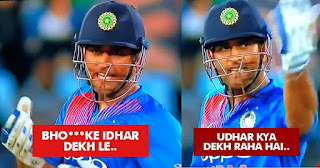 Did MS Dhoni Abuse Manish Pandey & Said Bsdk Idhar Dekh Le, Udhar Kya Dekh Raha Hai? Stump mics are just superb! In fact, they add to the entertainment quotient of the game. Often, we have heard cricketers discussing plans and strategies of their game. We were surprised with Virat Kohli had abused on the mike and said “BC, G**nd phatt jayegi”. Some trolled him, while some praised him for being a tough Delhi da Munda. After that, we had heard Dhoni addressing Virat as “Cheeku” on the mic. Today, during the 2nd T-20 Match at Centurion, South Africa, Dhoni was heard abusing Manish Pandey. Theirs was a 5th wicket partnership; the duo had scored 98 runs. When the score was 171/4, we got to hear the most surprising word from Dhoni. During 1st delivery of 20th over, ball was hit at leg side by Manish Pandey and after completing a single, Manish Pandey was looking towards the fielder instead of looking at MS Dhoni. So this is when MS Dhoni had to use this gaali.